German mathematician; born Dec. 7, 1823, at Liegnitz; died Dec. 29, 1891, at Berlin. Educated at the universities of Bonn, Breslau, and Berlin (Ph.D. 1845), he became teacher at Liegnitz, where he remained till 1855, when he moved to Berlin, in which city he continued to reside until his death. In 1860 he became a member of the Academy of Sciences, and the following year privat-docent at Berlin University, where he became professor of mathematics in 1883, having embraced Christianity. Kronecker was the greatest German algebraist of his time. He gave new demonstrations of Gauss's theory of the irreducibility of the segmental equations, of the impossibility of solution of algebraic equations of more than the fifth grade, and of the possibility of solution of Abelian equations. He solved also arithmetical and algebraic problems of the elliptic functions, and established the connection between the multiplication and transformation of the elliptic functions and the square forms of negative determinants, etc. He was one of the editors of Crelle's "Journal für Mathematik," first with Weierstrass, later alone. 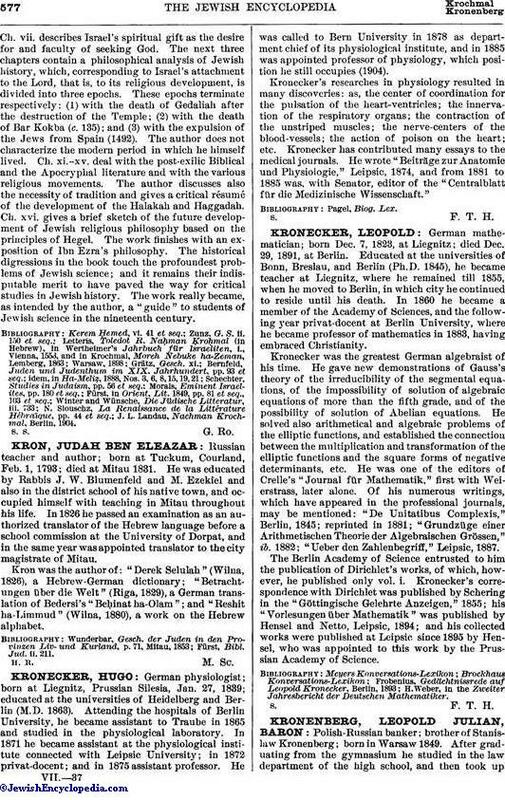 Of his numerous writings, which have appeared in the professional journals, may be mentioned: "De Unitatibus Complexis," Berlin, 1845; reprinted in 1881; "Grundzüge einer Arithmetischen Theorie der Algebraischen Grössen," ib. 1882; "Ueber den Zahlenbegriff," Leipsic, 1887. The Berlin Academy of Science entrusted to him the publication of Dirichlet's works, of which, however, he published only vol. i. Kronecker's correspondence with Dirichlet was published by Schering in the "Göttingische Gelehrte Anzeigen," 1855; his "Vorlesungen über Mathematik" was published by Hensel and Netto, Leipsic, 1894; and his collected works were published at Leipsic since 1895 by Hensel, who was appointed to this work by the Prussian Academy of Science. H. Weber, in the Zweiter Jahresbericht der Deutschen Mathematiker.